It seems I’ve already started week three of chef school. Where did week two go? Time is flying, and I am exhausted. In a really, really good way. So far, we’ve covered methods of food preservation (includingduck confit and gravlax), mayonnaise, hollandaise, bearnaise (and all of those other ‘naises), simple, mixed and composed salads, vinaigrettes, the potato (apparently there are a gazillion ways to prepare and serve potatoes – it seems baked, boiled, steamed, puréed, sautéed and fried is just the beginning. Yesterday was potato day, and, while “potato day” sounds fun – french fries! potato chips! mashed potatoes! – if I have to wash, peel, shape, boil, fry, sauté, mash or even look at another potato… Ahem. Let’s just say I’d be quite happy to never see another of the pesky tubers again. At least until Thanksgiving). Anyway, there’s also fish. We’ve started to work on fish. Which brings me to today. Today, Chef S. began our lesson by giving us some sage advice about being a chef. Being a chef, he said, is very hard. “Thees beeznees will squeeze you like a leh-mon.” So, he continued, it is important to remember and appreciate the beauty of the food you’re working with – how it looks, how it smells, how it tastes. “Always reemembehr how beautiful it is, ze food you are working weeth.” He then proceded to scoop out the eyeballs of a fresh striped bass with a melon baller. Hm. A few more chops to the poor bass’s fins, head, spine and entrails, and thus began fish day. It actually wasn’t so bad. I tried not to think about Nemo and apologized profusely as I took a filleting knife to my own striped bass and, after successfully filleting the little guy and cooking him in parchment (en papillote) with fresh vegetables, I felt very little remorse about gobbling him right up. He was delicious. Sorry, Nemo. This dish looks and sounds like it belongs with your best dress, but it’s actually easy enough to make on a weeknight (assuming you don’t have to fillet the trout yourself). In a pinch, this recipe would probably work with any white fish (halibut or chilean sea bass would be nice), but if you can get deboned trout fillets with the skin on, I highly recommend it. I didn’t think I liked eating fish skin until today – as it turns out, crispy trout skin is sort of great. Note: this recipe asks you to suprême a lemon, which is a fancy way of saying “remove the skin/pith and cut out the individual lemon segments.” If you don’t want to bother doing this, please don’t (I won’t tell Chef S). Just squeeze a liberal amount of lemon juice into the browned butter and onto the cooked fish. Voilà! Still delicious. Cut the bread into little cubes, and sauté them in butter until they are golden brown. Drain on a paper towel and set aside. Peel the lemons and cut out their individual segments (suprêmes). Chop up the lemon segments into small pieces and reserve as much lemon juice as possible. Cut each fillet in half. Salt and pepper the fish fillets, and dredge them in flour, shaking off the excess. Heat oil in a frying pan over medium heat and place the fish fillets in the pan, skin side down. The fish should sizzle when they hit the pan – if they don’t, increase the heat. When the skin side is nicely browned and the sides of the fish have turned opaque, flip the fillets and cook until the second side is done, about 1 minute. Remove the fish from the pan and place them on a clean paper towel to drain any excess oil. Place 2 pieces of fish on each plate and sprinkle the croutons, lemon pieces, and parsley on top of the fish. Wipe any excess oil from the frying pan (be careful, the pan will still be hot), and place 3-4 tablespoons of butter into the pan to brown. Over low to medium heat, cook the butter, swirling the pan, until it starts to turn brown (warning: this happens very fast, and browned butter doesn’t take long to turn into burnt butter, so be careful and take the pan off the heat as soon as you see any browning taking place). Add the capers to the browned butter and swirl (be careful here, too – the capers will sizzle and some butter may try to jump out of the pan). 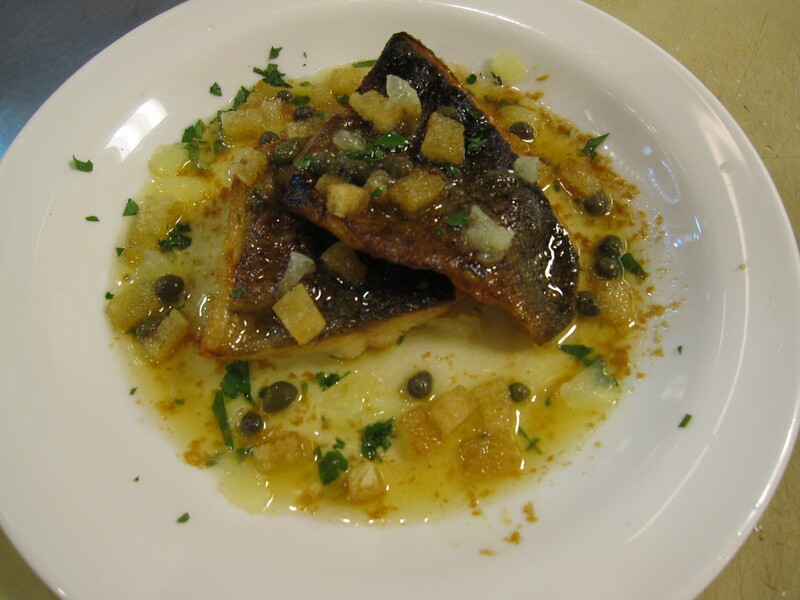 Immediately pour a bit of browned butter and capers over each plate of fish. Enjoy with a side of rice or veggies, and plenty of wine. Heh. No one is finding Nemo now. Couldn't resist. SO I want to quit my job tomorrow and come with you to culinary school. If I wear all white, no one will notice me, right? Sounds awesome, I'm happy you're blogging this for all of us to see!